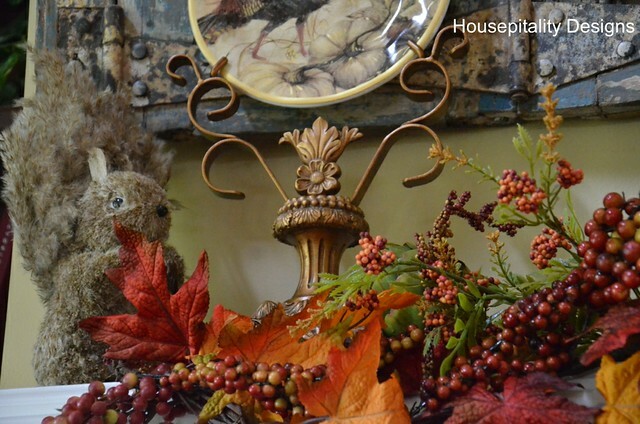 I began to add some Fall touches to the Great Room at the Berry Patch House. 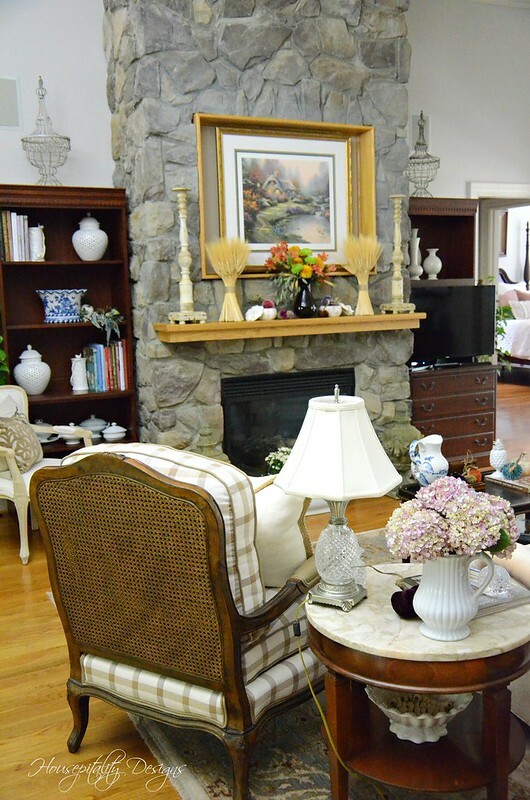 Today you will see some “sneakie peekies” of the Great Room. furniture that were never in my previous home’s Great Room. such as the Great Room, so I had to be somewhat creative. 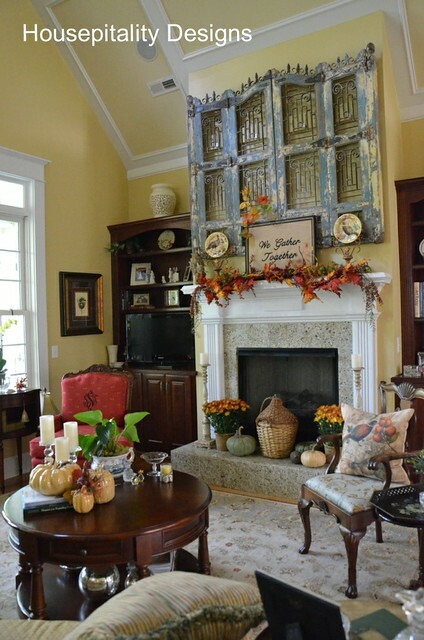 So here is the Partial Great Room Reveal – Fall Peeks. Fall is definitely creeping in a bit in my part of the country. We have cooler temps . . . well, cooler to me means it is not in the 90’s . . .
and I can see some slight changes in the color of the leaves on some trees. 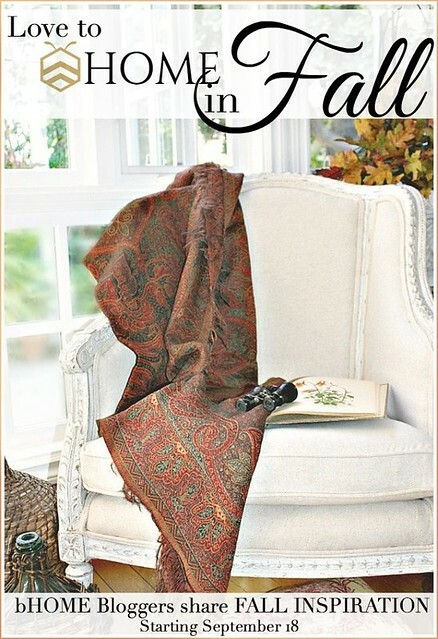 That being said, it is time for my Fall Home Tour AND A GIVEAWAY!!! So grab a seat and your favorite beverage and come along! 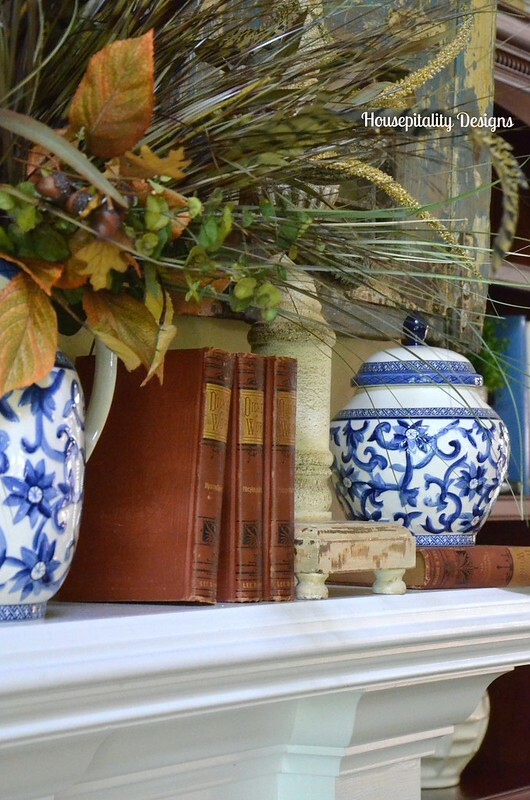 I am “fall”ing for blue for Fall decor this year. One, because I love blue. of being in the process of selling our home. and I caught some great sales. 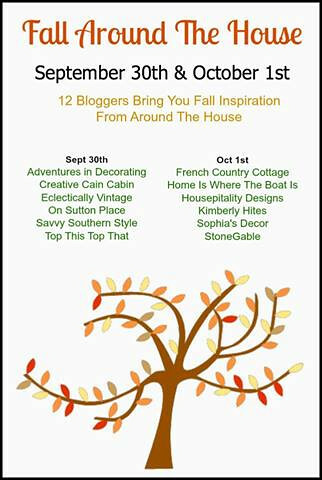 is happening both today and tomorrow with a most fabulous group of French Country bloggers. I am presenting my Great Room today with the star of the room . . . my new chair. 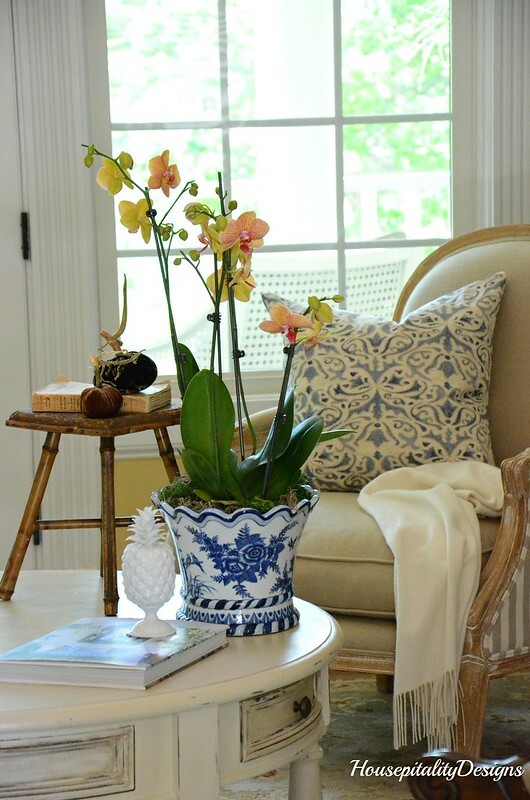 The Helena Chair from Soft Surroundings. Fall cannot come soon enough for me. 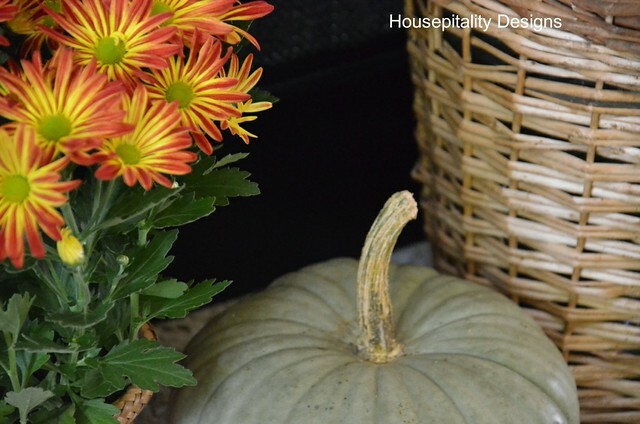 We have had an extremely hot summer and I long for the cooler, crisp days of Fall. 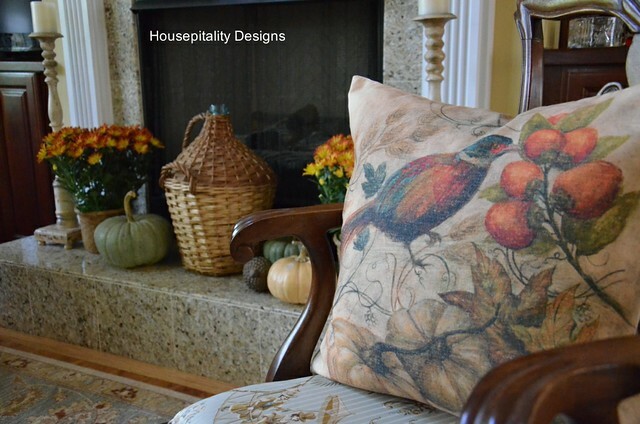 I have been doing some prep work to ready for some Fall home decor. I always look back on what I did in years past. These are some of the things I have done. Some of you may remember them, and hope my new readers will enjoy it. 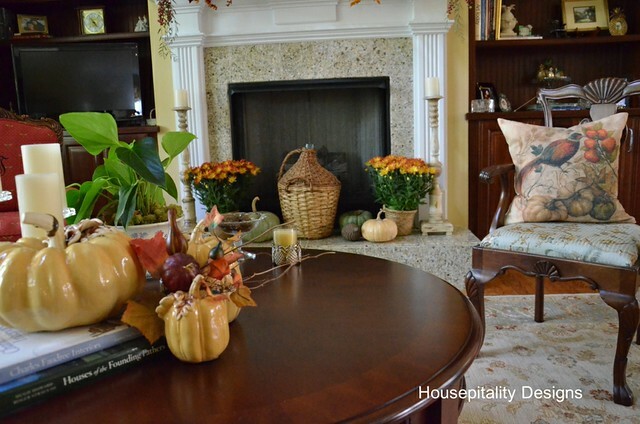 In decorating for Fall, I usually start in the Great Room with the mantel. Yesterday I participated in a Fall Ideas Tour. 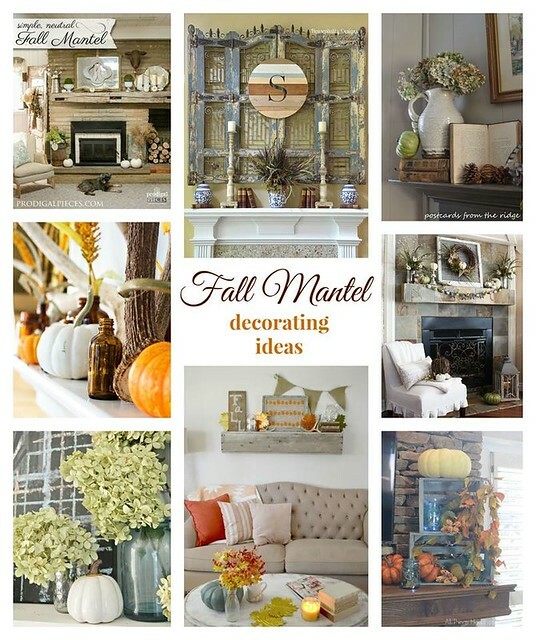 Day One featured mantels and I want to share some great Fall Mantel Inspiration today. 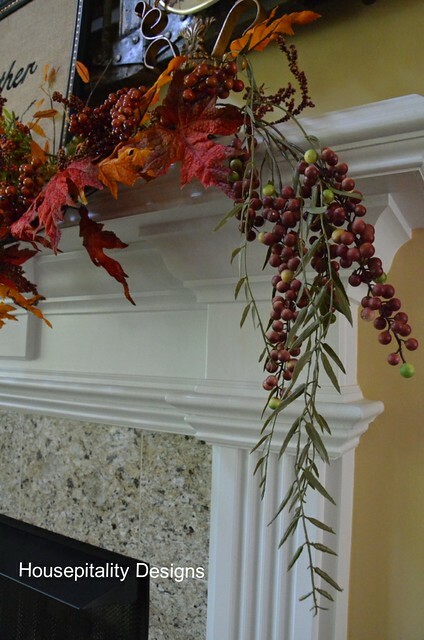 “fall-fy-ing” the mantel this year. with my friend and day trip partner. Our motto: No place is too far! 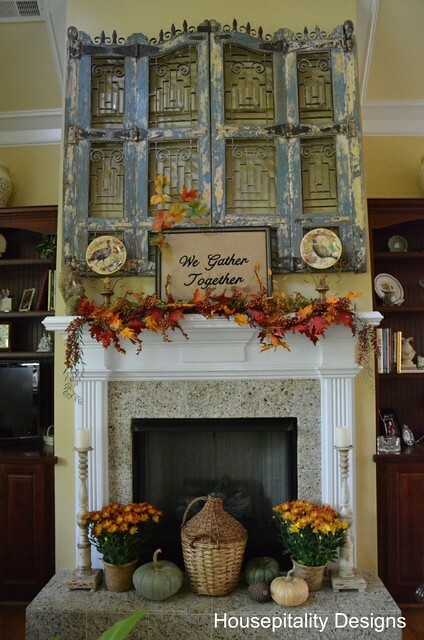 The last area to “fallify” was the mantel . . .
~ ~ however I did not want to add much fall foliage . . . just a simple vignette . . .
~ ~ ~ ~ to include the warm colors of Fall. 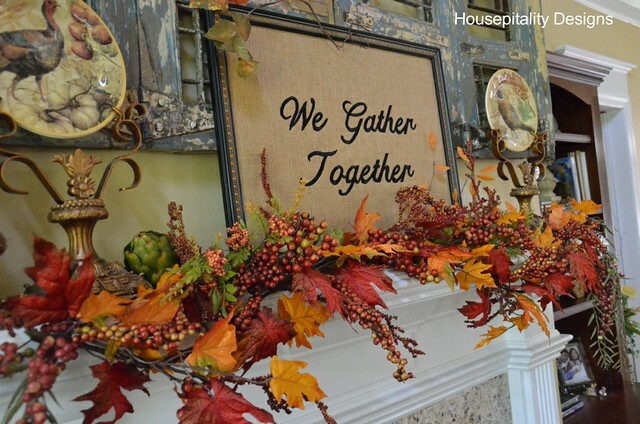 A bit of a departure from a past Fall Mantel. I started with this small platter by Myott & Sons, England/Banff, that I purchased for $5.00 . . .
~ ~ in an antique shop in Chattanooga, Tennessee. 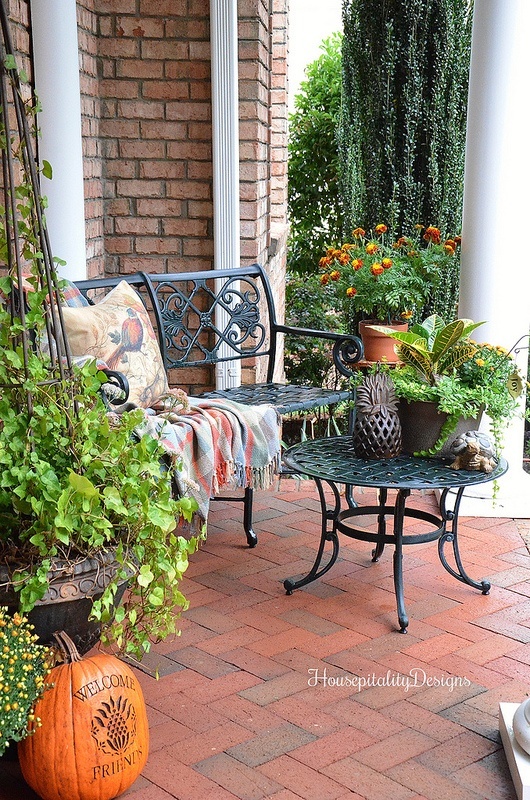 So here is the 2012 post for the Fall Mantelscape…. 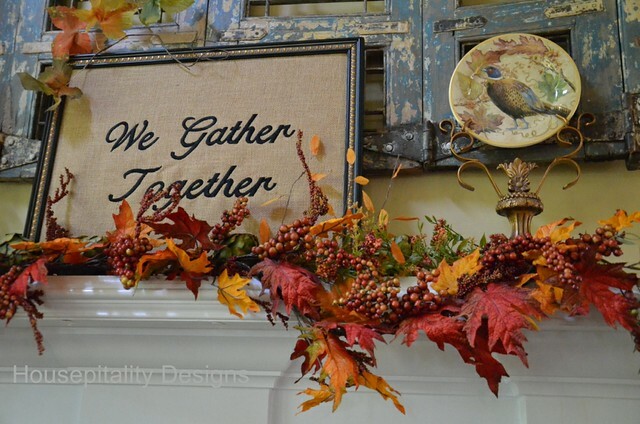 …..I just completed the Fall Mantel. 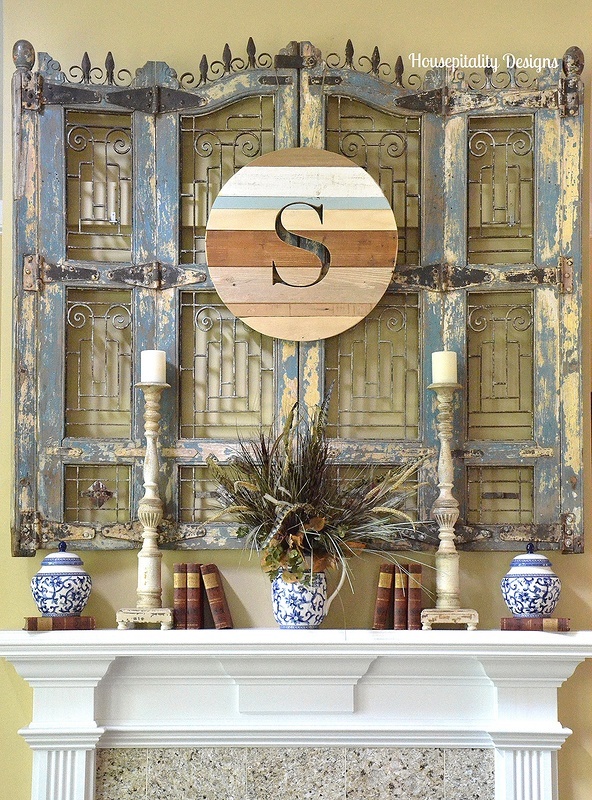 …..she monogramed it on burlap. I took my $1.00 frame I purchased several months ago and framed the inscription. 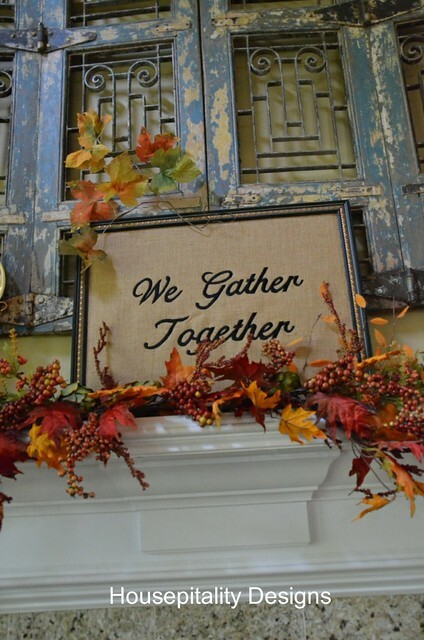 I love that message of family and friends coming together for the holidays..
…..and every day for that matter. And could not forget the cute little squirrel that I received at our neighborhood “Tacky Gift Exchange”…. …..a party that we have after Christmas….to exchange tacky gifts that we had received. Now, I do not consider “Sammy the Squirrel” tacky…was thrilled to get him!! 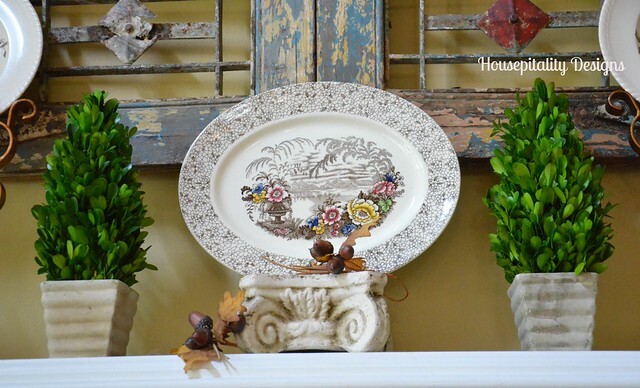 The plates are the Fresco Bird plates from Pottery Barn…a set of 4 different designs. 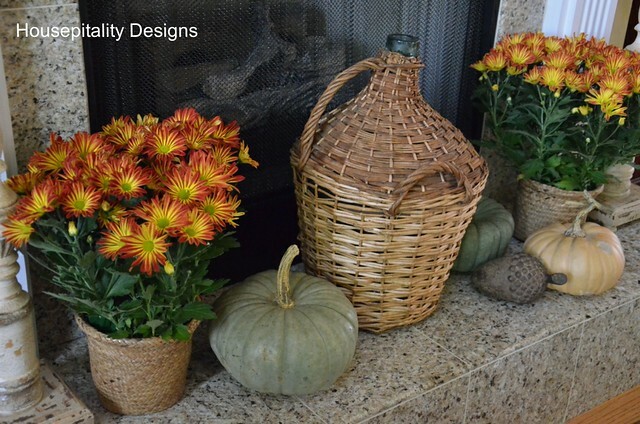 I added the pretty blue/green pumpkins and a faux pumpkin from Pottery Barn..
…..a giant iron acorn and mums from Trader Joe’s. My hubby chuckles at the fact that I will take all this time to create the “mantelscape”…. ……….it takes me that long!! 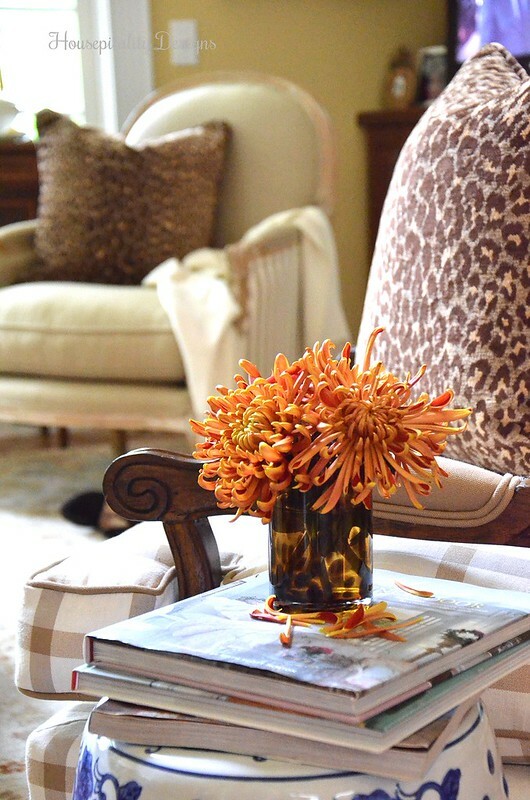 The pillow in the chair is Pottery Barn…love that it coordinates with the plates. 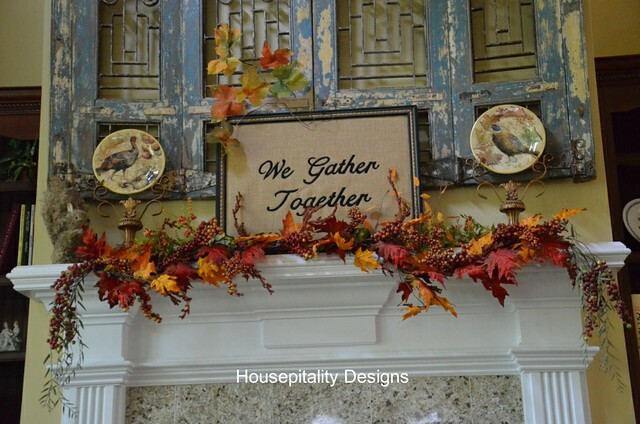 Hope you enjoyed my 2012 Fall Mantel and I thank you so much for visiting!! 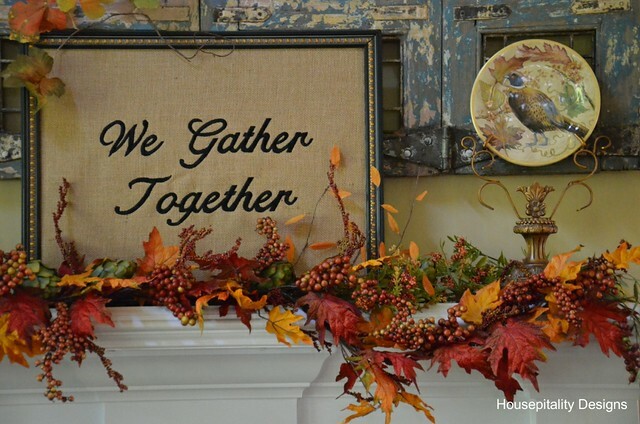 …..that I have to honor to participate in with 11 other wonderful bloggers!